Ahh…comfort food. 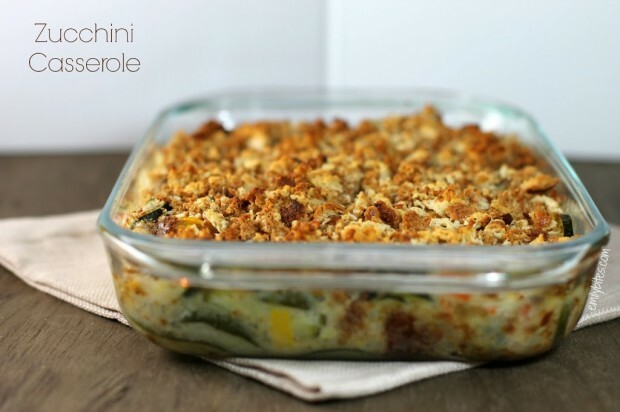 This zucchini casserole is one of those perfect year-round potluck side dishes that works for almost every occasion (see also: Cheesy Potluck Potatoes). While zucchini and summer squash are in abundance during the Summer months, this dish will seem equally at home as part of a Thanksgiving spread as it will on your picnic table for an outdoor barbecue. I love the textures in this dish – it’s creamy and hearty with a crunchy topping and it makes for a filling side dish to poultry, steak, burgers or fish. 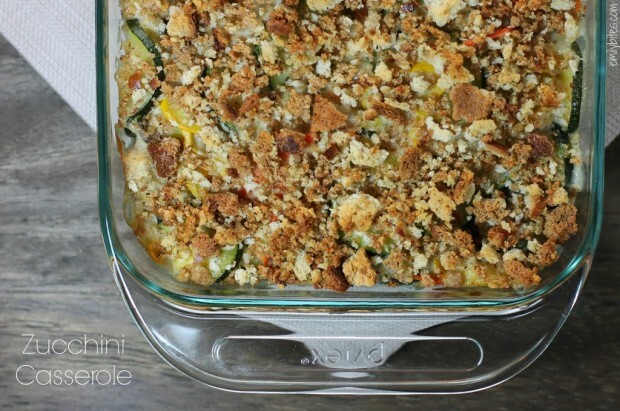 Not only is this zucchini casserole a crowd pleaser, it’s also super simple to make and rings in at less than 130 calories or only 3 Weight Watchers SmartPoints per serving. If you’re looking for more ways to use the zucchini in your garden or fridge, try one of these other zucchini recipes (you’ll see why it’s one of my favorite vegetables): Zucchini Squares, Zucchini Chicken Pasta in Tomato Cream Sauce, Parmesan Zucchini Rounds, White Vegetable Lasagna Cups, Sausage-Stuffed Baked Zucchini, Zucchini Chocolate Chip Muffins, Balsamic Roasted Vegetables, Zucchini Tots, or White Vegetable Lasagna. In a large saute pan or skillet, bring 2 tablespoons of butter over medium heat until melted. Add the onion, zucchini, summer squash and carrots and saute for 3-4 minutes. Cover the pan and cook for an additional 5-6 minutes until the zucchini and summer squash are tender. Remove the squash mixture from heat and stir in the cream of mushroom soup, yogurt, and 1 ¼ cups of the stuffing until well combined. Transfer the mixture to a 2 QT casserole dish (I used a 7×11 dish) and spread evenly. Melt the remaining 1 ½ tablespoons of butter in a medium bowl and combine with the remaining ¾ cup of stuffing mix. Sprinkle the stuffing across the top of the zucchini mixture in the casserole dish. Bake for about 30 minutes and serve warm. This looks awesome!! I think I might add it to the menu for Emmett’s birthday party. Thanks for sharing! This recipe looks absolutely delish! Made this to go with pork chops last night, I loved it!! And so did my husband! I think this is a new go to side dish 🙂 Can’t wait to warm up my leftovers for lunch! Oh my goodness!!! This. Is. Amazing!!! Made it tonight to go with grilled chicken, but I could’ve just eaten this! Excited to make it for friends next week!! Thank you for such a great, healthy, comfort food recipe!! Every time I make this, I can’t believe how great it is!! Absolutely delicious! I actually enjoyed it more the next day as leftovers! I want to make this on the weekend, but was wondering if it was ok to put it together the night/day before and bake it when i’m ready to eat. Anyone tried this yet? Sooo delicious! Both my husband and I loved this! Thank you, as always, for making healthy, Weight Watchers-friendly recipes that are so yummy! Just made this and it was DEELISH. Even my non-zucchini loving 9 year old liked it. Thanks for another wonderful recipe. This was so delish. Thanks for the recipe!! I got this recipe from my grandma years ago and love it. I usually add chicken breasts and make it a meal of it’s own. So delicious! Very good homey…comforting recipe. Happy to have another recipe for all the zucchini!! Ok so I substituted mushrooms for the shredded carrots and althought it changed the PP a little can I just say OMG?! SO SO GOOD. I made this with turkey meatloaf for dinner tonight, but with cream of broccoli instead of mushrooms, and it was so delicious. Thanks for another amazing recipe!! I decided to make this for our Thanksgiving potluck at work this week. So, I will have a ton of stuffing mix left over. So, I’m going to make it again for another potluck in a week or so, and then make two for Thanksgiving. That ought to teach that giant bag of stuffing a thing or two! I know you say it’s 8 servings but I’m just wondering if anyone knows how much a serving is, 1/2 cup? 3/4 cup? It’s so much easier if I know ahead how much I can have and then let the family just take what they want. I might actually run out in the snow today to get what i need for tonight. i’m making blackened fish and this would go great! Do you think I can substitute sour cream for the yogurt?? It’s what I have on hand. When you say 2 medium sized zucchini about what weight (size in inches) are we talking about? Because I’m sure my view and everybody else’s view of medium is different. 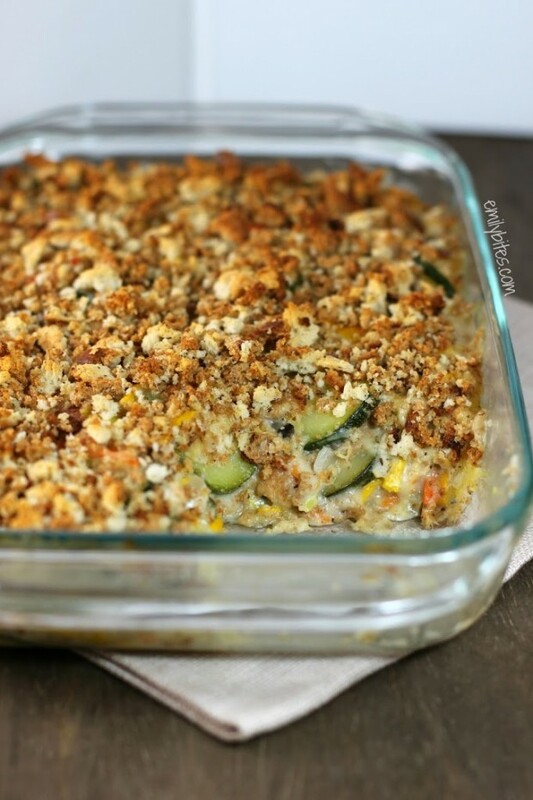 This would be even healthier if you substituted Quinoa for the stuffing mix! Looks delicious. I agree with christine davis ! Id like to know the exact measurement for servings as well (oz or cups) since i am the only weight watchers in my home & everyone else likes to take as much as they like ! So excited to try this ! I don’t have that information as that’s just not how I measured out this recipe. I can try to figure it out when I make it again in the future, though I’m not positive when that will be. If you want to figure it out yourself, you could always weigh your casserole dish empty and then weigh it again when the casserole comes out of the oven. Then you have the total weight of the contents and can divide that up by the number of servings. I hope that helps! Sorry i don’t have the information you’re looking for on hand. Hope you like it! Can you use something else in stead of butter? I read people using chicken stock to make stuffing would that work or you need the butter? The ingredients say 2 cups, but the directions uses only 1 cup?? I see that the 1 is on a different line. I first saw it as 1/4 cup, but it’s actually 1 1/4 cups. I just made this last night it was SOOOO good! Super easy recipe to follow, and I was happy with the generous serving portion. 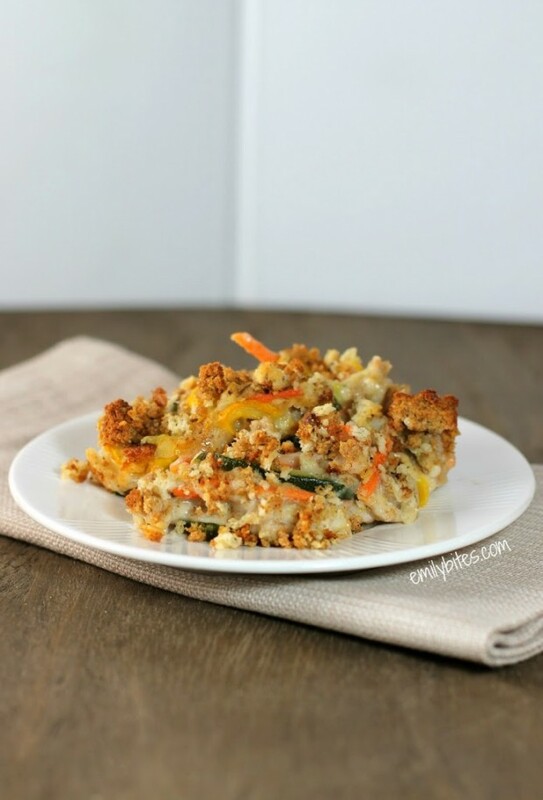 I skipped adding in the butter to the stuffing mix at the end and simply topped my casserole with dry stuffing mix (to save on calories) and it was still delicious! My mom used to make this casserole when we were kids and I have dreams about it every once and a while. Today is one of those times. I am going to cook up some chicken and mix it in with it so it becomes more of the entire meal so I don’t have to dirty so many dishes on a Monday night! Hopefully it turns out nice! I tried this tonight but made a few adjustments to fit my dietary wants and it was delicious! I removed the stuffing and nixed the last tablespoon and a 1/2 of butter. I also added shredded chicken, and immediately after removing from the oven, I sprinkled 1 cup of low fat cheese on top so it would melt and the casserole cooled. It was delicious! I’d like to make this recipe, but I really do not like canned creamed soup. What might be some other healthy options? What’s the Sodium content, I didn’t see it listed. COuld you use a 9×13 pan or would it be too thin? Thank you for the recipe. I think it’s a great basic recipe that will lend itself to variations…I’m thinking corn, celery, jalapeño, broccoli, different types of soups, etc. For those wondering how much medium zucchini and/or yellow squash weighh, the weight is approximately 10-12 oz. for 2 medium of each type. This recipe is absolutely delicious. Thank you so much! Absolutely love this! This is the second time I made this and it was just as good the second time. It is going to be a favorite in our home. Easy to make also.